In the two years since, in ninety-nine blog entries, I’ve made my case for hiking the trail, and I’ve tried to be a source of good information regarding skills, gear, history, and anything else related to the JMT. 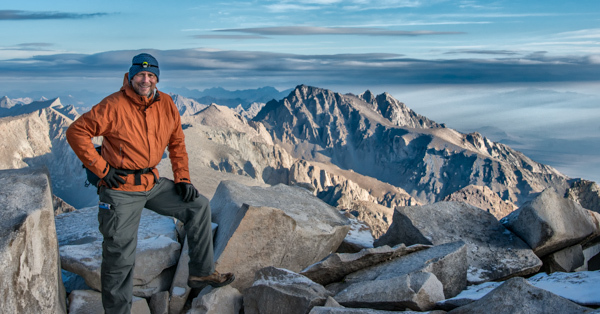 I met several readers of this blog on the trial, last year, which was as personally rewarding as reaching the top of Mount Whitney. When it comes to the history of the trail, the story of the first ascent of Mount Whitney ranks first, with the history behind the names of passes second. Did you know that Whitney was almost called Fisherman’s’ Peak? Hiking the trail, unless you are moving VERY fast, means arranging resupply. Here are a few unconventional ideas on what to put in your resupply package, and a couple ideas on what to leave out. People seem to enjoy hearing what it’s like out there. The two most popular posts in that vein are “The First Day” and “The Great Squirrel Incident”. Last, every once in a while I get an email telling me that “Hiking the Trail with Your Spouse” made all the difference in the success of their husband-and-wife adventure. To all of you who continue to check the blog out each week, thank you from the bottom of my heart. The book is doing far better than I could have hoped, and I have some new ideas I’m looking forward to implementing in the near future. See you next Tuesday, when I start with the first of the second hundred entries. Thanks to everyone who has visited this blog over the last two years! I deeply appreciate the support! Happy 100th post..looking forward to the next 100!! Ray, congrats! I like your writing style and enjoy all the different aspects of hiking you cover. Appreciate the kind words, Darren. Happy 100th! I always enjoy your posts, and while I don’t comment on every one, I read every single one faithfully! Keep up the good work. The JMT is definitely worth a second trip. Good luck, Dan! I am getting ready for a July 4, 2015 start and I have found your ebook and blog to be helpful and thought provoking. As a trained Boy Scout leader of 17 years, you supply one of the key ingredients to a good trip…information from someone whose been there and done that. Thanks for an entertaining and informational read!! Thanks Loren, for the comments, and good luck on your adventure. What a great time you will have!